Here's the problem with Android Wear. Although my G Watch R is always with me, notifying me and taking my commands, controlling it with anything but voice seems a tad cumbersome. You can realistically hold and interact with a phone using one hand, but you can't with a watch. You need both hands, which, if you ask me, feels like a step backwards sometimes. If my right hand is in my pocket, or holding something, steering, mixing a batch of cake filling, typing, grocery shopping, brushing my teeth, climbing a mountain, squeezing a lemon, or otherwise occupied, I have to interrupt whatever it is doing and bring it together with my left wrist to take care of a new notification on my watch. Or, and I'm not proud to say I've done this before, I have to raise my watch to my nose and swipe and tap that way. Aria wants to solve that issue. It aims to make your watch completely gesture-friendly, relying on the movement in your wrist's tendons when you flick your fingers or open your hand. Think of its functionality as a mix between Android Wear 5.1's new gestures and Thalmic Labs' Myo armband. 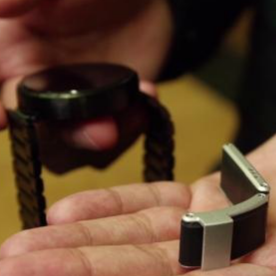 The sensor attaches to your watch's band and sits on the inside against your skin. It has a built-in battery and a Bluetooth module that lets it communicate with Android Wear. When you wear it, you can perform certain gestures with your fingers and they will be translated as commands to your watch. So yes, your finger flick can be sensed by Aria, sent to your watch, relayed back to your phone, which then maybe skips a song on your speaker. It's like a train of Bluetooth wagons connected together. Aria will be launched on Kickstarter in the next couple of weeks. The one described here, which has the sensor, battery, and Bluetooth connection, will be $169 and have an SDK so developers can integrate it with their Wear apps. A cheaper $69 band will be only made for the Pebble Time, using the watch's connectors to directly integrate with it — no battery or Bluetooth module on this one.